There is an indescribable beauty to the interaction of glass and light. Here in our Bluffton studios, we have glass installations that change the play of light into the studio depending on the time of day and also the time of year. 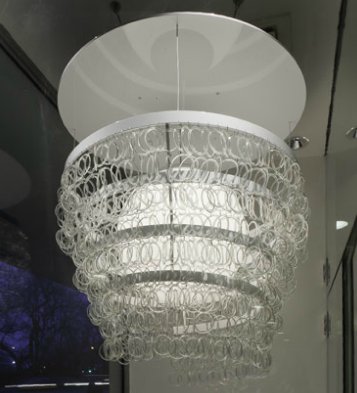 For Recycle Glass Month, we’d like to share the beauty of recycled glass through Kathleen Plate’s recently revealed Smart Glass Guggenheim Chandelier. Kathleen’s beautiful pieces are made from recycled glass from soda, wine, beer and even salad dressing bottles. It’s another clear example that glass – with its three simple and natural ingredients – can be endlessly and beautifully recycled. In addition to the Smart Glass Guggenheim Chandelier and Kathleen’s other works of art for the home, she is the founder and designer of Smart Glass Jewelry with this beautiful work showing up on fashion-forward runways and the small screen.